These sauces have ambiguous ingredients. But don't worry, they come from Italy. Thanks, Rob. 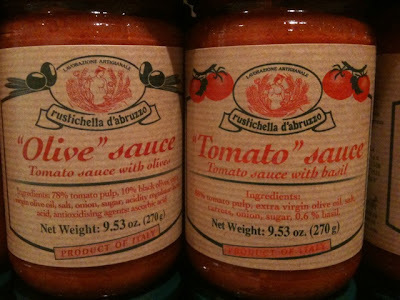 Well, the "olive" sauce may be a legit use of quotes since it clearly is predominately tomato, but the "tomato" sauce can't have THAT much basil or it would be pesto.